We brought our pigs home late in January. They were 60 pound pigs at the time. Because winter has been so harsh we thought the best place for them was in the greenhouse with the chickens. Salatin gave a presentation (The one I’m thinking of was at UC Berkley in 2005 but the link appears to be broken) where he says at 75 pounds the pigs get a hankering for chicken legs. Well, that only took two weeks. We now have one less New Hampshire pullet. I can’t afford to feed my layers to my pigs. The pigs just aren’t worth it. So off they go. We wheelbarrowed the pigs out to the shed with just two days of negative temperatures remaining in the forecast. 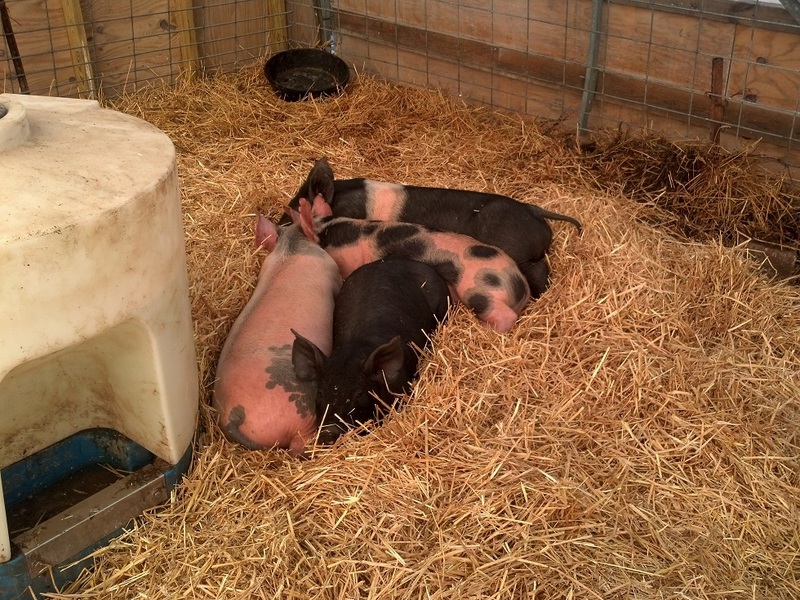 We bedded them on the remaining bedding from the previous batch of pigs we shipped out about a month ago. There is a good pile of straw they use for a nest on cold nights. They are dry. They have a warm place to lie down. They have food. They have water. They don’t have chicken dinners. I wish they were still in the greenhouse though. Maybe I’ll figure something out for next year. More that that, I’m counting down the days until the pasture thaws and firms up. This entry was posted in Pastured Pork. Bookmark the permalink. I never could get into the pigs in the greenhouse thing here, the pig manure in my food crops turned me off. I only had one greenhouse at the time and couldn’t afford a greenhouse just for pigs and long term crops like Salatin. He now has concrete sidewalks for floors in the pig greenhouse (s) to keep them from rooting out and for easier cleanout. They plant in the gap between the sidewalks. I have seen his sidewalk idea. That’s all about cleanout…not getting the tractor stuck. Pigs in a greenhouse was like a dream. For us and for the pigs. The greenhouse rarely got into single digits even when it was double-digit negative outside. I would support an argument that maybe it’s not the most sustainable idea to raise pigs in the winter but they are such handy animals to have around I’m willing to work a little harder to have them. But not willing to sacrifice pullets for the cause. I think we didn’t have the predation because we had them with our hens, pullets are kind of…dumb, and more morsel size. Videos I’ve seen of Salatin’s hoophouses that have chickens and pigs together show two different set ups, depending I believe on the stage of the pigs – in one the house is full of tables/platforms, the feed and water for the chickens is up on these and there is plenty of space for the chickens to stand around up there, or to flap up there in a hurry if a hungry omnivore shows too much interest. The other set up I’ve seen him use is to divide the house, and keep pigs in one end and chickens in the other. He has biggish hoophouses that make that practical – might not work in a smaller one, depends on population size too, I suppose. I had my pigs corner a turkey and eat it in about 3 minutes… they do like fowl. Yup. It was something we knew and expected…we were just hoping it wouldn’t happen so soon.